Item Description This arrangement was printed exactly as it is here in the Harp and Claymore collection. 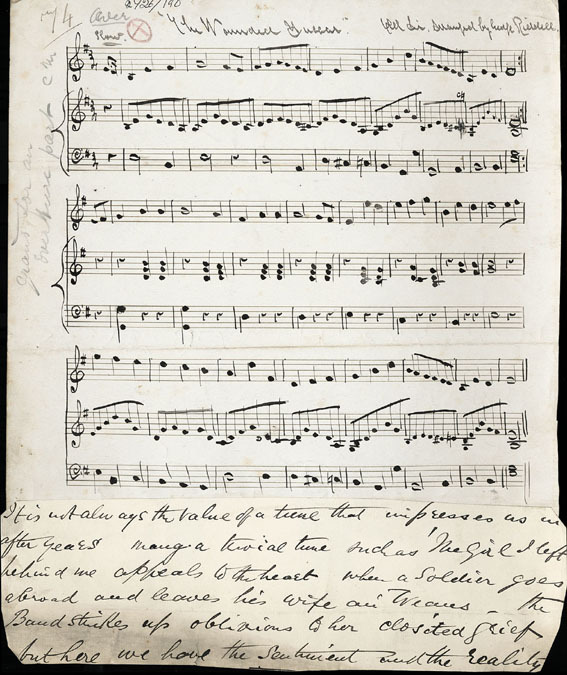 Note on left margin [Skinner's hand] 'grand for an overture part C m [C minor ]'. Pasted under the music in Skinner's hand: It is not always the value of a tune that impresses us in after years many a trivial tune such as 'The Girl I left behind me appeals to the heart when a soldier goes abroad and leaves his wife an' Weans - the Band strikes up oblivious to her closited [sic] grief but here we have the sentiment and the reality.' Alexander Troup believed this melody to be : 'a very fine Irish air'. It may have a connection with the Gows.